The real significance of this gas flare probably lies decades in the future, though the Japanese are talking about commercial production by 2018. The technology for getting fuel out of hydrated methane, also known as clathrate, is in its infancy. After many attempts to turn this “fire ice” into gas by heating it proved uneconomic, the technology used this week – depressurizing the stuff – was first tested five years ago in Northern Canada. It looks much more promising. Methane hydrate is found all around the world beneath the seabed near continental margins as well as in the Arctic under land. Any combination of low temperature and high pressure causes methane and water to crystallise together in a sort of molecular lattice. Nobody knows exactly how much there is, but probably more than all the coal and oil put together, let alone other gas. The proof that hydrate can be extracted should finally bury the stubborn myth that the world will run out of fossil fuels in any meaningful sense in the next few centuries, let alone decades. In 1866, William Stanley Jevons persuaded Gladstone that coal would soon run out. In 1922 a United States Presidential Commission said “Already the output of gas has begun to wane. Production of oil cannot long maintain its present rate.” In 1956, M. King Hubbert of Shell forecast that American gas production would peak in 1970. In 1977 Jimmy Carter said oil production would start to decline in “six or eight years”. Woops. 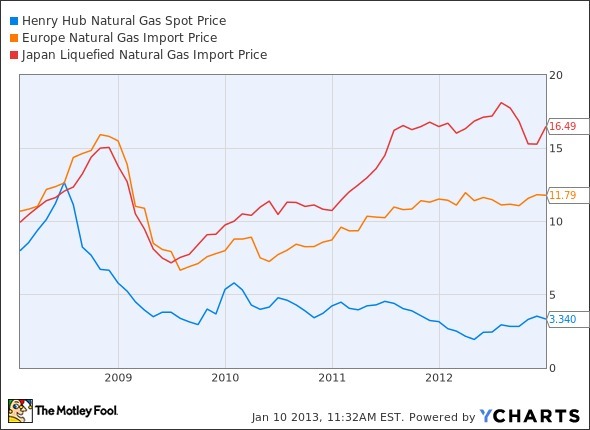 The shale gas revolution is effectively already putting a ceiling on the price of energy. America has lost its appetite for gas imports, which now go to Europe and Asia instead, but is gaining an appetite for exporting gas. Domestically, America’s cheap gas has caused electricity generators to switch from coal to gas, and buses and trucks to start switching from oil to gas. Even if hydrate proves stubbornly expensive – and it’s generally wise not to bet against Japanese ingenuity – it will put a roof over this price ceiling. Hydrate and shale are not the only new sources of gas. Thanks to newly perfected drilling technology, new deep-sea gas fields are coming online off Brazil, Africa, and in the eastern Mediterranean. The days when gas production was concentrated in a few charming places like Iran, Russia, Venezuela and Qatar are gone. Indeed, one of the best ways to love the new gas-fired future is to list the people who detest it. As recounted in a new documentary film called “FrackNation”, Vladimir Putin, at a dinner with journalists in 2011, suddenly became agitated about the supposed devastation of Pennsylvania by shale gas industry. His new-found concern for the Appalachian countryside might just have something to do with the threat that shale gas poses to Gazprom’s stranglehold on European markets. For those still concerned about climate change, this is also good news. In atomic terms, methane is one-fifth carbon and four-fifths hydrogen. Not even the most die-hard environmentalist can find anything bad to say about burnt hydrogen, or “water”. Given that combined-cycle gas turbines run at higher energy-conversion efficiency than coal-fired steam turbines, the carbon dioxide output from gas-fired electricity is well below half that of coal-fired. Moreover, there is a possibility that methane hydrate could be almost carbon neutral. The University of Bergen in Norway has developed a process that pumps carbon dioxide into the hydrate deposits, where it replaces the methane, turning methane hydrate into carbon dioxide hydrate. The results from a field trial in Alaska are expected any day. If this process can be scaled up, and if the carbon dioxide from burning the methane could be captured economically (big ifs), in future Japan could run on fossil fuels but generate almost no carbon emissions. As it takes market share from oil and coal, gas will dominate the world’s energy supply for much of this century, before perhaps giving way to something cheaper. That could be cheaper and safer forms of nuclear energy based probably on thorium rather than uranium, or maybe solar power. Not only has cheap gas given the United States falling carbon dioxide emissions, it has also delivered it a huge competitive advantage in manufacturing. Firms are “re-shoring” their operations from Europe and even China, as the low cost of American gas outbids the low cost of Chinese labour. To be competitive, countries must have either cheap labour or cheap energy. The European elite’s strange determination to have neither is the root cause of its current stagnation. You say in response to my Times article that the production of H2O through the burning of fossil fuels is "actually worth worrying about". It made me get out my calculator! I'm not much of a physicist or mathematician, so feel free to check my working. We produce about 26 billion tonnes of CO2 a year by burning fossil fuels. CO2 molecular weight is about 6 times that of water. Then we produce about 9 billion tonnes of water vapour each year by burning fossil fuels. Total worldwide evaporation and precipitation of H2O is 550,000km3/yr. 1 km3 = 1.57 billion tonnes. So 863,000 billion tonnes of water falls from the sky each year. So fossil fuel burning adds 0.001% to the natural water cycle. 99.999% of rainfall is natural. Of course, local effects could be larger, but are just as likely to be beneficial as bad, and that would make the general effect smaller still. "Worth worrying about"? Surely not compared with other environmental issues? 2nd update: I made two mistakes above, according to those with better physics knowledge than me. The molecular weight of CO2 is 2.5 times that of water; and 1 km3 of water weighs 1 billion tonnes (of course). So the true result is that fossil fuel burning is adding 0.002% to natural precipitation, not 0.001%. Still well short of "worth worrying about".